No other company is so uniquely qualified to solve your septic problems. We are devoted to our customers, and all services are backed by "Satisfaction Guaranteed". All SOS personnel will provide you with prompt, courteous, professional services. If ever you feel our services are somehow inadequate, insufficient, or incorrect, then we will return to your site and perform that work again - as many times as is necessary - all at no additional charge to you. We stand behind all our work. When you want it done right, you want Snowden Onsite! We've been pleased with Snowden Onsite for 20 years. We use SOS. They are really good. The owner, Jeff Snowden, helped us solve some major problems with our system a few years back. 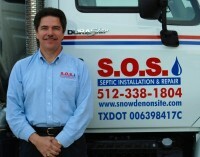 We recently used S.O.S./Snowden Onsite Septic, Inc. and were very happy with them. I am writing to let you know how much I appreciate the service I have received from your company and in particular the exceptional service I received from your young representative! I appreciate the great service you have provided me. Thanks. Thank you for eight years of outstanding service. Wanted to say that this was the best pumping service ever. The guys were professional, polite & did an outstanding job. They were the most thorough ever & didn’t even have to ask them to do it, they just did. We appreciate Jeff coming out + explaining the system to us. Thanks. We're really happy working with you. I like the monthly payment program. Thanks for doing a great job. I appreciate your prompt response to any of my calls. I also (+ my husband) liked Septic 101 instruction! Denise has been excellent in taking care of my needs - she's an outstanding representative for SOS. The last service call was the best we have received. We are new to septic system & your service. The info we received & the 1 on 1 training session was SO HELPFUL. Thanks to ALL who have kept us up & running!!! Hey Jeff, I like doing business with Native Austinites when possible. Have not had an occasion to use more than inspection service, but this has been good overall. I really appreciate the help & patience we received when we first moved here & were septic novices! We're appreciative of your help! We appreciate your quick service! We're very happy with service, response, and results. You do what you say you are going to do - unlike my two (2) former service companies. All around excellent service, thank you. Always respond promptly to our calls. Thanx! Thanks for taking care of us. Providing Quality Service...Guaranteed In the Greater Austin Area of Travis, Hays, Williamson, Burnet, & Bastrop Counties , Onion Creek, Point Venture, Manor, Wimberley, Buda, Bear Creek, Bartlett, Williamson County, Hutto, Misc Locations, Bell County.